PANAMA CITY, April 11, 2019 /PRNewswire/ -- The third edition of the Global Business Forum (GBF) on Latin America concluded yesterday (April 10th) in Panama City with a call from government and business leaders to capitalise on new trade and investment opportunities that are emerging in the Latin America and Caribbean (LAC) and Arabian Gulf regions. Held under the theme "Next Hubs, New Regions", the two-day forum featured 17 sessions and 46 speakers. Among the high-level attendees and speakers were H.E. Juan Carlos Varela, President of Panama; H.E. Jovenel Moise, President of Haiti; H.E Isabel de Saint Malo, Panama's Vice President and Minister of Foreign Affairs, in addition to several ministers, top government officials and business leaders from the UAE, Panamá, Haiti, USA, Brazil, Argentina, Colombia, México, Uruguay, Jamaica, Dominican Republic, Honduras, Ecuador and Paraguay. During the forum, the Panamanian President called on Panamanian's public and private sector players to participate in Expo 2020 Dubai which he described as an ideal opportunity for Panama to showcase the potential it can offer the world. The Haitian President stated that his country is focused on developing its infrastructure, improving connectivity, and investing in several sectors, such as agriculture, renewable energy and healthcare, adding that these are all areas where it is looking to expand its cooperation with the UAE and other countries. H.E. Hamad Buamim, President & CEO of Dubai Chamber of Commerce & Industry said: "The third edition of GBF Latin America achieved its objectives of exploring new business prospects between the LAC and Arabian Gulf regions, fostering constructive dialogue between business communities on both sides, and paving the way for long-lasting partnerships. 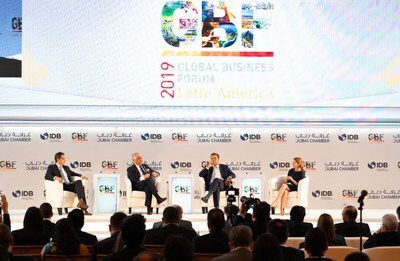 We see the strong participation in the event as a a positive sign of growing confidence in Dubai as a preferred hub for Latin American companies."